Most people agree that income inequality and wealth inequality are increasing in the U.S. Likewise anyone who’s paying attention is aware of our slow rate of GDP growth, averaging 2.2% per year, since the end of the recession five years ago. Is there a connection between inequality and slow growth? Maybe! 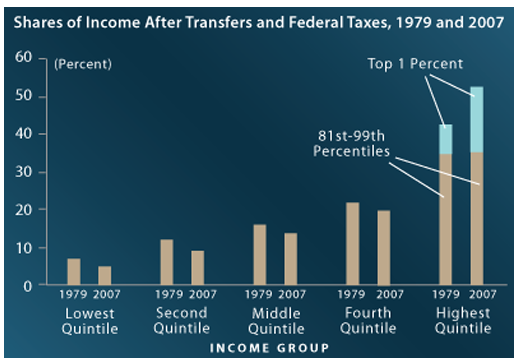 First of all, it is important to note that income inequality in the past 30 years has been greatly offset by federal taxes and transfer programs as shown in the October 2011 chart (above) from the Congressional Budget Office. 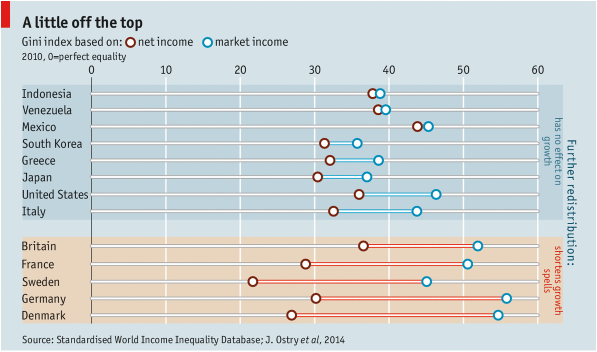 Secondly, the Economist discusses this situation in the article “Inequality v growth”. The economists Jonathan Ostry, Andrew Berg and Charalambos Tasangarides have shown (see above chart) that a large amount of redistribution affects growth more negatively than a smaller amount of redistribution. Economists generally agree that the recovery has been slowed down by a lack of demand by consumers for more goods. So the recovery should speed up as less affluent consumers feel secure enough to spend more money. Two things, to start with, can make this happen. One is a restoration of the housing market so that homeowners have more equity (which can be borrowed and spent). Another way to accomplish this is with government redistribution programs, such as food stamps and Medicaid, for low income people. But there is an even better way to put money in the hands of people who will spend it, and at no cost to the government. I am talking about broad based tax reform, whereby tax rates are lowered for everyone, offset by closing tax loopholes and shrinking deductions, which primarily benefit the wealthy. For the two-thirds of taxpayers who do not itemize deductions, and who tend to be the less affluent, such a tax rate cut will put money in their pockets, most of which they will spend. Such a tax program as this would be a direct shift of resources from the wealthy to everyone else, thereby lessening inequality. It would stimulate the economy, creating millions of new and higher paying jobs, and thereby increasing tax revenue and lowering the deficit. Win, win, win, win! This entry was posted in Andrew Berg, Charalambos Tsangarides, economic growth, economic inequality, food stamps, growth, growth vs equity, inequality, Is capitalism in crisis?, Jack Heidel, jobs, Jonathan Ostry, Medicaid, redistribution, tax reform, The Economist and tagged debt, deficit, economic growth, GDP, inequality, jack heidel, tax reform, The Economist, wealth inequality by jackheidel. Bookmark the permalink.